When filmmaker Derek Jarman publicly declared himself HIV positive in 1987, he acknowledged that the public would “expect” a response within his work. 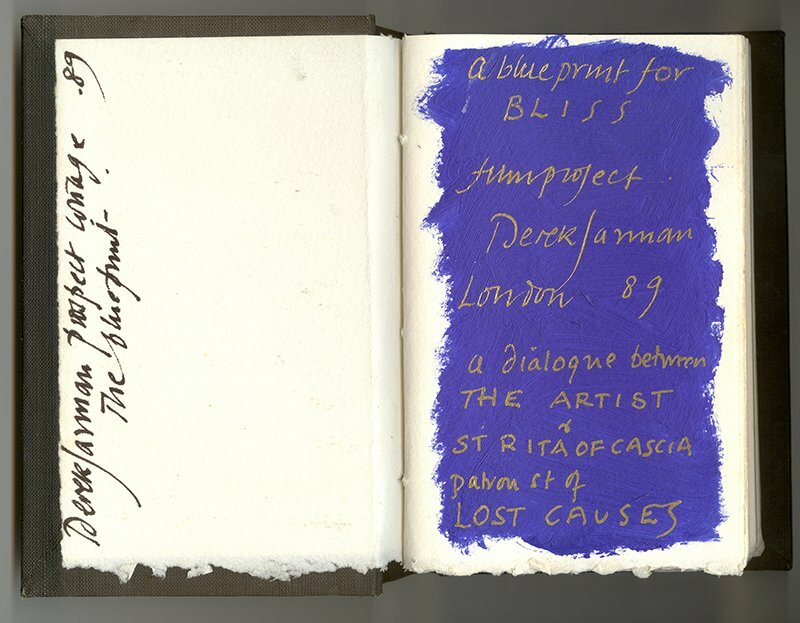 “I left it as long as possible, because making a film about illness is jolly difficult.” The result is Blue (1993), a 35mm film comprising a single and continuous 79-minute image of International Klein Blue (IKB), accompanied by a voice-over in the form of Jarman’s personal autobiography. Blue is often described as a film without image, a film without materiality. In this way, the work could be said to follow the logic of avant-garde structuralist filmmaking. But this description of a dematerialized film is not only a conceptual interpretation of the work, but also a description of some of the ways in which this film practically functioned. Although its primary release was to cinema distribution, the BBC broadcast a “simul-cast”: presenting an audio dub version of Blue on the radio; and distributed a postcard of IKB, so that its audience could gaze upon the colored card in the privacy of their homes and listen along with their transistor radios. Similar incarnations of the film appear in poster form, performance, and television. Blue was thus not only a film emptied of image, but it could be a film without film, a film without cinema. The Walker’s Ruben/Bentson Moving Image Collection houses a pristine 35mm celluloid print of Blue, soon to be shown as part of the forthcoming “Commemorating Derek Jarman” film series, and screened in relation to Jarman’s approach to his filmic apparatus. But when the Walker originally presented the film in the galleries (outside of the cinema context), conservation concerns over wearing down and scratching this 35mm print through months of looped projection led to a different solution: a flickering projector (aided by a piece of kit called “The Flicker-O-Meter,” whose manual can be found in the Walker archives) would beam through a projection window coated with a blue gel. This filmless projector would thus throw a perfectly IKB shade, accompanied by a CD dub of the soundtrack. Again, Blue was a film without film. Both then and now, Jarman’s masterpiece raises intriguing technical questions of how to show a film, particularly regarding its digital presentations. While a recent transfer of Blue from 35mm to Blu-Ray has offered a new standard for the digital presentation of the film, questions of display has now turned to the surface on which the work should be projected, most notably with a recent screening of the work at the IMAX in London where the modern screen, which is digital and 3D-ready, was noted in returning a slightly different shade of Blue. Such technological queries are explicitly foregrounded by Blue’s simplicity and minimalism. Indeed, throughout his career, Jarman was acutely aware of the properties and limits of the mediums in which he worked, most notably his love of Super-8 as a “cinema of small gestures.” So too, the flicker of 35mm celluloid insists on a filmic grain that emulates the original material and surface of IKB: the painted canvas — Jarman’s first medium as an artist. As Blue fluidly migrates between the medium of celluloid, digital, audio, and the printed page, the primary concern of the work — the depiction of Jarman’s experience of HIV and AIDS — also leverages its power from the ineffable. The virus, and the experience of it, lacks an iconic image, body, or definition that can fully convey the overwhelming devastation and the complexity of its occurrence. AIDS necessarily exists in multiplicity of people, narratives, and times. 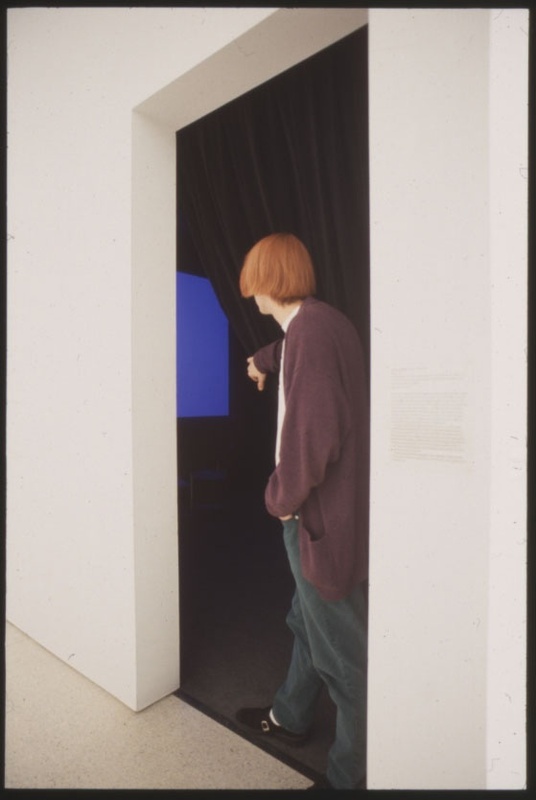 By the time Jarman came to finishing Blue, complications from AIDS-related illness and its treatments had left him partially sighted, leaving a haze of blue in place of vision. Emptying out the image, removing the comfortable props and traditions of cinema in favor of a filmless and perhaps even placeless meditation thus offers a glimpse of the unfamiliar landscape that Jarman rendered in parallel to his own life with and death from AIDS.